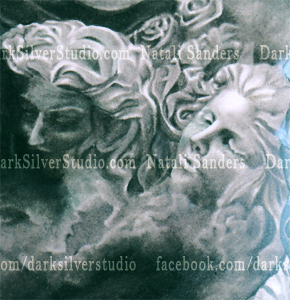 In 2012 I painted, "Ursa Minor #5, Bathory," through BDI, with with oil, airbrush, acrilic, and Prismacolor pencils on Strathmore 14x17 paper. 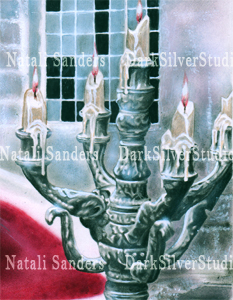 Bathory took me roughly 160hrs to paint. When I got this project, I didn't want this to be just another Bathory painting, with her in the tub and dead girls all around. That's all I found when I researched. So, I took her out of the tub and made her body language of relaxed and indulging. 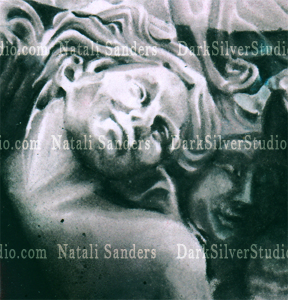 Then for the dead girls I thought of a sculpture I had seen in a movie where spirits were casted to stone and placed into purgatory. My favorite part of drawing this cover was the tub.